A groundbreaking new study, the Social Progress Index, suggests that economic development is “necessary but not sufficient” for social progress and quality of life.The bad news for America? It isn’t even close to being number one. Each component of the rankings includes a range of subcategories that reveal a greater diversity than can be reflected in a single measure like gross domestic product. G8 countries Germany (#12), the United Kingdom (#13) and Japan (#14) fare pretty well overall. The rankings of fast-growing economies like China (#90) and India (#102), meanwhile, show that despite despite their fast-paced development in recent years, they still have more to do. And the U.S.? It comes in at 16th place. 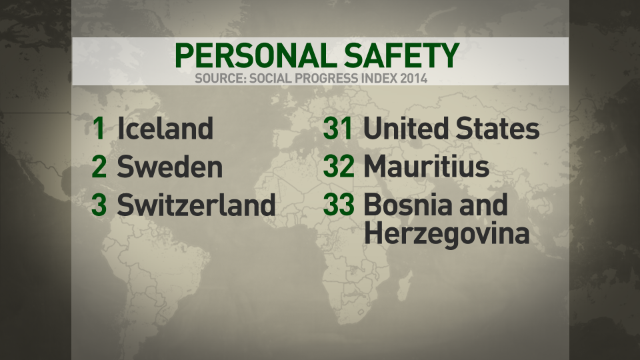 Breaking the numbers down, the U.S. ranks 31st in one of the subcategories for basic human needs: personal safety. This measure includes violent crime and homicide rates. Indeed, in the latter category, the U.S. is tied at number 41 with turbulent countries like Ukraine and Lebanon. In the political terror sub-category, the U.S. ranks 80th, along with Venezuela, Indonesia and Cuba. The U.S. scores especially badly in health and wellness (#70) and ecosystem sustainability (#69). Health and wellness is based on measures like the obesity rate, where the U.S. ranks, perhaps unsurprisingly, at 125. The only countries with lower scores are Mexico, South Africa, United Arab Emirates, Jordan, Egypt, Saudi Arabia, and Kuwait. But for another subcategory of basic human need, undernourishment, the U.S. comes in first place (along with 65 other countries ranging from the United Kingdom to Malaysia). And the U.S. belief of itself as “the land of the free and the home of the brave” does get some support from the index. For both political rights and freedom of speech, the U.S. is ranked first. Of course, many other countries share the top spot in both rankings; the other first place nations for free speech span the globe, from Japan and Australia to Mali and Chile. In addition, the United States does well on the issue of education, at least in terms of advanced education. America comes in first for access to advanced education, although it does fall short in some sub-categories, ranking 24th in inequality in the attainment of higher education. So the picture is mixed, and it is clear that no one measure can completely capture the entirety of a nation. Still, the Social Progress Index underscores that there is no room for complacency – in the United States or anywhere else. The "picture is mixed" because it was meant to be. I don't think this info was meant to get out to JQ Public! 31st for basic human needs, ie: personal safety!! Thats not good! And 41st with turbulent countries!!! Makes ya wonder WHY we are spending so much on a military budget and we rank 41st in the world??? WTH??? Speaking of basic human needs, I want a pepperoni pizza, NOW! Particularly with our WONDERFUL NSA dept! And yea im being wwwwaaaaaayyyy sarcastic on that! So we must REALLY look rather foolish to all these countries allys AND enemies, that we've been spying on, doesn't it? I doubt that I would be happy living in Iceland or Sweden for personal safety, but I love Switzerland, and I could easily live there. Now, in New York, NY, one is aware of greatly lowered personal safety, even walking down the best streets on the Upper East Side. i do not feel a tremendous lack of personal safety in London or Paris. I feel uncomfotable walking to a New York pizzeria in the upper east side, so I call Dominos for a fresh pepperoni pizza. My big question is does this index correlate with the international transparency corruption index. Another interesting comparison would be with the percentage of the population who practice religion (of any kind). At the last census the % of people in New Zealand (the country that is top of the index) who reported a religion was 45%. My other big question is, when it rains, is there a positive correlation between pizza sales and rainy weather? What percentage of pizza in New Zealand is pepperoni? It is 63% in the United States. Ah lol! So organised religion is the key you think? Personnally i cant agree with that at all. Spiritualism is much more affective to a persons character than what church they attend. Ok @ PM i guess i misunderstood what you were saying. My apology. @chrissy. A gift certificate for a pepperoni pizza from Pizza Hut would finalize your apology. Lmao having fun Jeff? Easter is just another trolling day huh? Knock yourself out ya tool! The United States also leads the world by far in charity. If were so miserable how come were so willing to help others and the rest of the world that is so amazingly happy and in a state of bliss is unwilling or should we say incapable? Lol very good point @ steve! And charity begins at home! It should also END there! GDP? The US will always come tops, now and for a very long time. Reasons: I am yet to find a people so full of zest and compassion as they are. However, on the latest SPI, Social Progress Index, they are ranked 16th; Not as bad as to command the kind of hoopla that has greeted the news. Food for thought for those who have vilified the President rather than support him for daring to reconfigure for good the flawed operatives of "the Land of the Brave and the free". USA rankings in education, security, business, social progress, health care, ... can be improved with new foreign policy orientation: back to partner markets such as EU, NATO, NAFTA and away from Asia (no China, no S.Korea, no Vietnam, ...). "Social Progress" in the US is measured by the number of tea party patriots getting their teeth fixed. Sales of dental floss south of the Mason-Dixon line is another indicator. Two social workers were walking through a rough part of the city in the evening. They heard moans and muted cries for help from a back lane. Upon investigation, they found a semi-conscious man in a pool of blood. "Help me, I've been mugged and viciously beaten" he pleaded. The two social workers turned and walked away. One remarked to her colleague: "You know the person that did this really needs help." Profound ? Perhaps !! Insight into how our safety net operates ? Good indication !! An indication of cracks in our system that need patched ? Definitely !! Yes, @ bobcat, your story is profound. This doesn't come as a surprise to some of us who have always known some of these things. It is the reason some of us use the word 'ignorant' to explain some of the views that some uniformed Americans hold of others. It is not an insult but as a way of describing what we know about some of the views and perceptions, which isn't necessarily true. We will never be able to convince those who don't believe it. It is important that we improve on all aspects of life and society starting with our govts. If I did the study the results would be entirely different. Lmao @ bobcat, pretty accurate story too! Interestingly, the Economist Intelligence Unit (EIU) told the same story in its "The Lottery of Life" analysis. The time has come for every American to use a mirror and not a screen ! These rankings are so subjective. Sweden out-ranks the US is many of these categories, yet the emigration rate of Swedish citizens to the US is much greater than the emigration rate of US citizens to Sweden (on a per capita basis). So Canada ranks in the top 10 worldwide and #1 in the G7. Was anyone surprised? As an indicator of social progress in America, buy two or three tickets to the Metropolitan Opera in NYC and make yourself stay through each performance, right to the final, mandatory standing ovation. Then ask yourself whether you want to buy some more tickets. Next, listen to recordings of opera singers who made their MET debuts forty or fifty years ago. Ask yourself whether you would buy a ticket to hear those singers (Callas, Tebaldi. Corelli, Albanese,,,). Of course, I realize that those singers all made their debuts more than ours!!!!!!!! forty or fifty years ago. I was listening to their recordings during the 1950s. The StupidPhone contribited the "ours!!!!" I did not mean to say that, Motorola did.